A playmaker in the receiving game, Riddick was at his best in 2015, when his 2.2 yards per route run average was the most among all running backs with at least 50 targets in the passing game. Over the course of his five-year career, Riddick has seen an NFL passer rating of 108.2 on targeted throws, and he has produced a PFF receiver grade of at least 80.0 in three of the past four seasons. In a crowded backfield in Detroit, where rookie Kerryon Johnson is routinely tipped to see the most work, don’t be surprised to see Riddick as the team’s primary threat out of the backfield once again in 2018. Over the past three seasons, White has seen more targets than carries every season, totalling 244 targets and 181 carries including the playoffs. In that span his PFF receiving grade has always been 74.3 or higher, including an 86.1 grade in 2016. His Wins Above Replacement level of 0.71 is one of the best among veteran running backs, and with his ability to make plays out of the backfield, he’s a great fit in New England. Johnson recently signed a new deal, and it’s one that is great value for the Cleveland Browns considering the value he offers as a receiver. With his ability to do damage out of the backfield and lined up in the slot or out wide, Johnson was one of the most valuable running backs in football in 2017 with a WAR rating of 0.80. 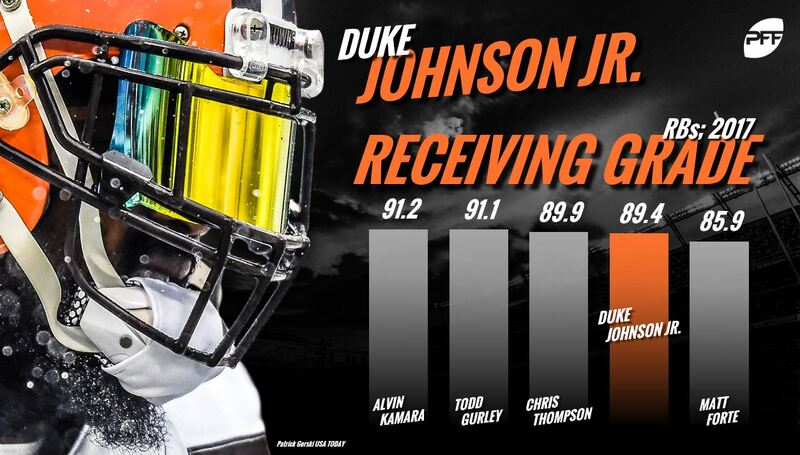 In a league that is valuing playmaking receivers more and more, Johnson ranked fourth with a PFF receiving grade of 89.4 last year. Ivory averages $2.75 million per year, with just $1.25 million of that guaranteed, and while he is no longer as effective as he was earlier in his career, he is still a solid complementary running back for the Bills backfield. Ivory is coming off a career year in terms of NFL passer rating on throws where he was the target, coming in at 107.5 last year. This was helped by the fact that he dropped just one of the 22 catchable passes thrown his way. He’s not going to be the running back you want to see 300 carries from in a season, but instead he’s a solid player you can use to spell your starter. 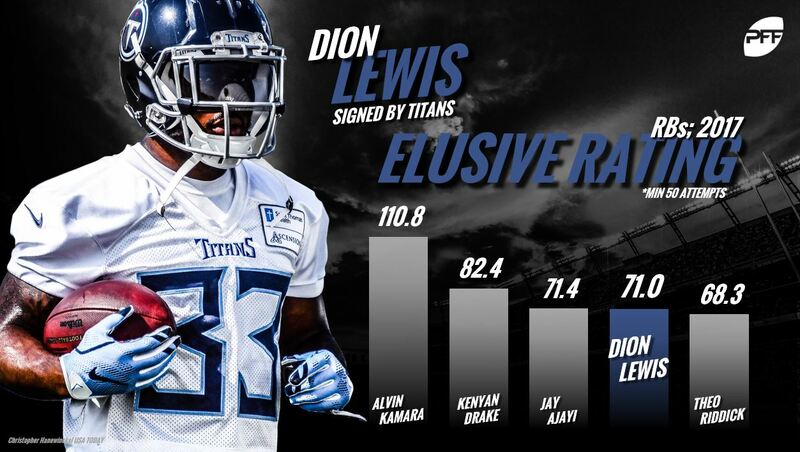 Lewis signed a deal with the Titans as a free agent, and his ability to find success beyond the help of his blockers to go along with an average of just $1.4 million per year guaranteed makes him great value in Tennessee. Of running backs to see at least 50 carries in 2017, Lewis ranked fourth with a 71.0 elusive rating, averaging 3.2 yards after contact per carry and 49 combined missed tackles forced as a runner and as a receiver.